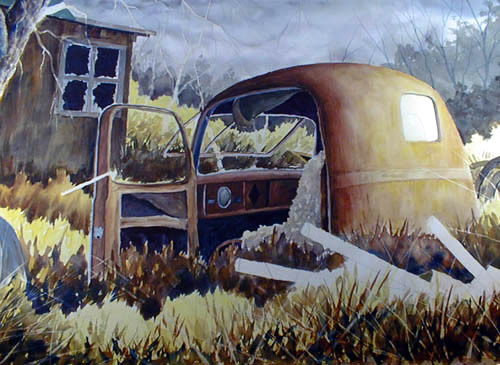 Watercolor Painting Demonstration - "Spirit Animates Eternal Years"
I began my watercolor journey in 1975. At that that time, I was a Captain in the United States Air Force and working as an instructor pilot and flight examiner at Altus AFB, OK. It was a change from my previous assignment where I was gone from home, about half of the time. At Altus, I trained Air Force pilots to fly the C-141 aircraft—a four engine jet about the size of a medium size airliner. Our time was spent in the local area—flying training sorties out of the airbase, and consequently, I had a lot of time at home. Since I was home more often than not, I got connected to the base art’s center and learned of a watercolor workshop to be held in the spring. I promptly signed up because watercolor was a medium I had always wanted to explore. Journeys are strange things—they are strange because sometimes you don’t even know you are about to begin a journey, and then one day it dawns you that something has changed in your life. That certainly is true of my watercolor journey. When I signed up for that workshop, I didn’t have the slightest clue about what changes it would weave in my life over the next 37 years. I took that workshop and fell in love with watercolor. The fluid nature of the medium, the way light played over the paper, and I suppose the exacting nature of painting a credible watercolor all appealed to me. In fact, they reached out and grabbed me, shook me around, played with me, intrigued me, and delighted me, and still haven’t let go almost 40 years later. I’m as crazy about watercolor now as I was when I first saw amazing things happen when I dipped a little pigment into some water spread on paper. The artist that presented the workshop was a watercolorist by the name of Robert Gartland. 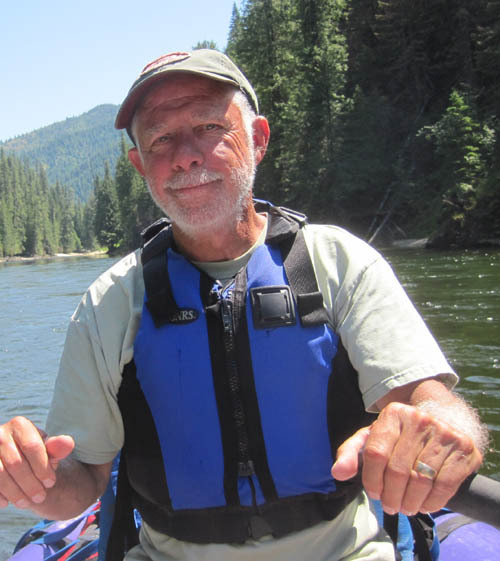 He was a kind and mild-mannered gentleman that spoke with that lilting drawl you only find in Oklahoma. It wasn’t a deep-south drawl—or that Texas drawl—it had a hint of the south, a dash of Texas, it just hinted at southern roots. At that workshop I learned a lot—and I’m sure had a lot to learn. Being the wise old age of 30, I thought I knew a lot more than I did. When I left the workshop, I knew I had some ability, but I also learned that I didn’t know all that much. But my bravado wasn’t a complete waste because when you think you know something (no matter how misplaced), you aren’t quite as afraid, and are willing to jump in like you own the whole deal. Well, I jumped in and fortunately for me, did know enough to keep making a complete fool of myself. I came close. Now, I’m the ripe old age of 68, and loving watercolor as much now as the first time I picked up a brush and painted that first watercolor. It has been a great journey. I always have a watercolor paper stretched and on my painting table. Most of my watercolors are large, 45”x 32”. They take time, but I like it that way because it gives me time to think as I’m painting—no rush jobs. I hope you enjoy my demonstration. 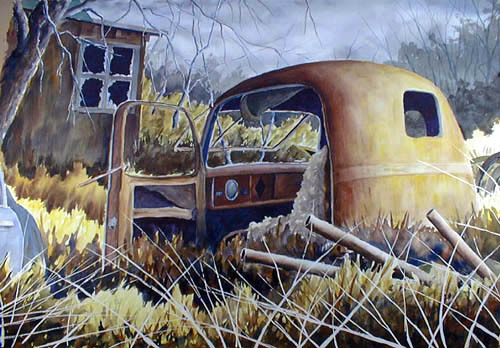 I thought it might be interesting to talk about what goes into one of my big truck or car watercolors. 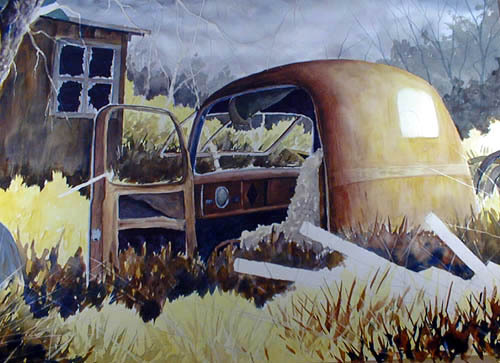 Obviously, it is impossible to include everything that happens during a watercolor–there is so much beyond description. How I hold the brush–how I move the brush for different effects, the way I sense what is happening on paper–looking and understanding the sheen of the wet paper–you get the idea. All that takes experience and it has taken me a long time to get to where I am. I will try to tell you about it, but ultimately, you must paint, and think, and find your own way. 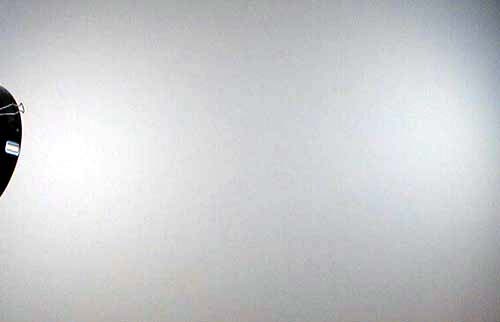 The blank page–it can be a pretty scary thing. To get to this point, I’ve already cut and stretched a sheet of paper. For my bigger paintings, I cut paper from an Arches Watercolor Roll. The roll is 45 inches across and 10 feet long. I usually cut the paper about 34 inches by 45 inches. Once the paper is cut to size, I cut some butcher tape to the same measurements and make sure my staple gun has plenty of staples. I wet a sponge for the butcher tape and take my paper to the bath tub. I soak it for a couple of minutes, bring it back to the studio and put in on a piece of plywood, attach the butcher tape, and staple it about every two inches. You can’t see the drawing very well in this thumbnail, but if you click on the image, you will get a larger presentation of the finished drawing. 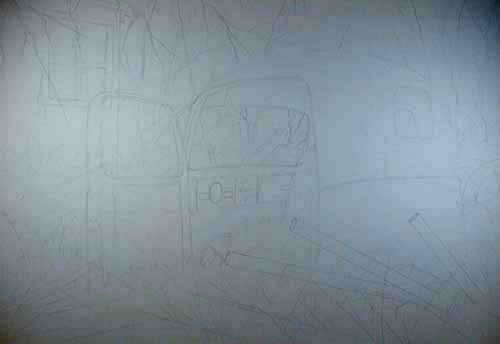 After the paper has dried, I start the drawing. With one of these cars or trucks, there is a lot to the drawing. I don’t skimp on making sure I have everything in and just right. I’ve learned over the years that it pays to think the whole thing through and get it right the first time. It is pretty aggravating to get half way through a painting of this size and effort and find you have left something critical out. These line drawings usually take 2 to 3 hours. Again, you can’t see the thumbnail very well. Click for a larger image. 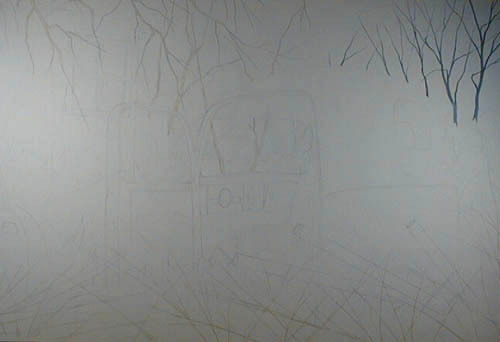 Once the drawing is complete, I mask off areas that are too small to painting around comfortably. In this particular composition, there are some trees cropping in from the upper left, and I want to paint that area wet and fast. I also mask off a number of weeds in the bottom of the painting. Again, I want to paint those areas pretty loose and wet, and don’t want to take time to work around the weeds. Generally I start my paintings with the sky–they are painted wet on wet and seem like a good place to warm up. In this painting, I wanted to overly the trees on the right with the wash of the sky, so elected to begin the painting with those trees. Not much happening with them, just some tree trunks with a medium value–the color was a mixed blue gray using thalo blue, red rose, and quinacridone gold. The wash coming up is for the sky. I try to pre-mix enough pigment to do the job, but many times find myself a little short. It isn’t a big problem–more pigment can be mixed in short order. Here I have mixed a color similiar to the trees, but a little warmer gray–thalo blue, red rose, and quinacridone gold–but more red rose to keep it on the warm side. To lay in the sky, I first wet the whole sky area. Once I have that area wet, I start lacing the area with pigment. I say lacing because I’m trying to bring areas of pigment onto the paper, but not so consistently that I have a pure gradiation. I want white areas so show up, creating the effect of clouds and overcast. I also like to make the washes stronger in the corners–that seems to block the eye from moving off of the page. When I do this sky thing with my art students it doesn’t take them long to catch on. The hardest part is making sure you don’t do too much. Quick laced washes and then stop!!! There are some parts of the painting that I can just go fast with dark pigment–the deep shadows. But most of the time, I’m leaving my options open. I will lay in a wash and let it ride for a while. I’m thinking that I want to come back to it–more intensity of color or a couple of steps down on the value scale. 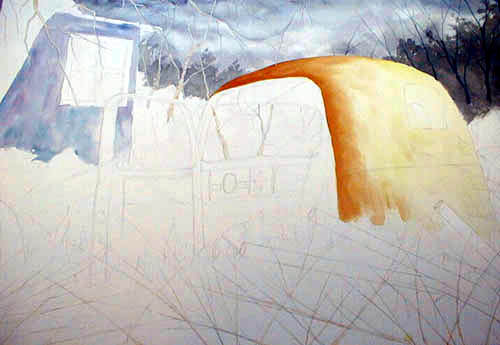 As we go through this painting, you will see me amplifiying initial washes to suit my sense of what is happening. Once I had the sky in over the trees, it was time to work a bit more in that area. I wanted a stronger dark mass coming into the painting from the upper right, and so I layed in a foliage mass–better to blend the trees, and give a better darker shape to the upper right-hand corner. This was mixed with some thalo blue, a bit of quinacridone gold, and a dose of burnt sienna. I’m thinking that I want to hold the viewer’s eye on the main subject–and I need a reasonably strong dark shape in the right corner. I’ve also layed in some foliage between the house on in the upper left and the vehicle. The next wash will be the initial wash for the truck body. This was is done wet on wet. I wet the entire area that I want to paint and then lay my pigment on evenly. I’m using a pure wash of aureolin. This is a wet on wet wash using my two inch red sable brush. I bought this brush back in 1977 and it cost me about $45. You can’t even buy a brush of this quality and size today. 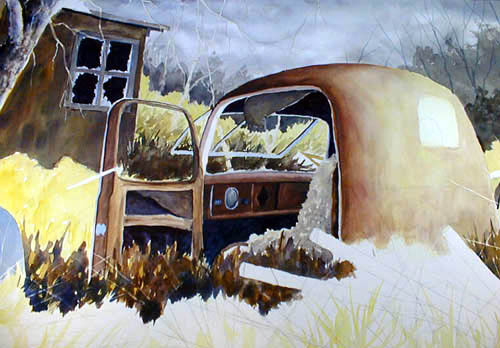 As we move through the painting, you will see how I continue to build on this initial wash. Glazing the truck body like this gives me time to determine how the different values within the painting are coming together and also creates a nice effect–it just gives the body that bright glow that is perfect for the watercolor medium. 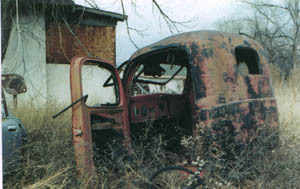 You can start to see how the dark shape of the foliage on the right is pulling the viewer’s eye in toward the truck body. A second wash on the truck body, and again it is done wet on wet. I am just building the form of the body. There isn’t much to these washes as long as you get your pigment on the paper and don’t play around with it too long. I have introduced a bit of quinacridone gold along with the aureolin. I can remember when I was a child watching a Disney movie. There was always this paint brush that would paint the scene before your eyes. 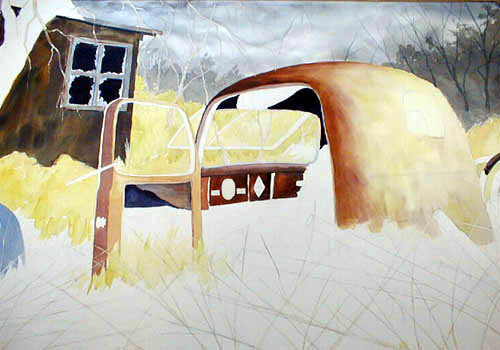 I always have that feeling as I’m progressing through a painting. At this point, I want to move to the upper left-handed corner and build a shape for the house in the background. This is an important shape for the painting because it will create a strong movement from the left-handed corner to the truck body. I chose a mix of ultramarine blue and burnt sienna–with ultramarine the predominant color. Again, I have left the wash lighter than I really want it–I’m also not sure I want to go with ultramarine blue. 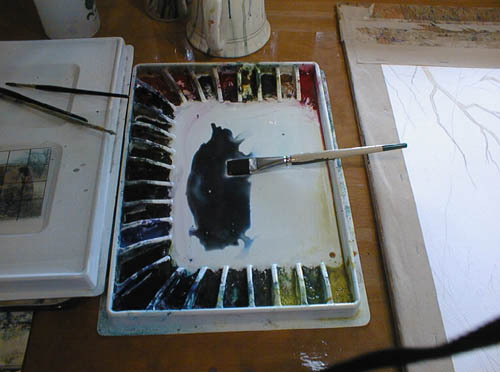 If you are having difficulty with the mud syndrome try using more pure pigment and if you have to mix to make the color you want, try letting the pigments mix on the paper rather than your palette. After looking at the blue wash on the house for a few minutes, I decided I want a color that will connect better to what I’m using on the truck body. I mix a strong wash of ultramarine and burnt sienna–it is almost the same color a burnt umber, but it allows me to let the pigments granulate on the paper and makes for a more interesting wash. You can see I didn’t hold back on this wash. If anything, I got it a bit too dark–I will decided about that later in the painting when I have many of the other dark washes on the paper. This was was done wet on wet. You can see that I’m painting pretty much from the top of the painting to the bottom of the painting, slowly working my way down. That is generally the way most of my landscapes go. I guess it allows me to go from general to specific. 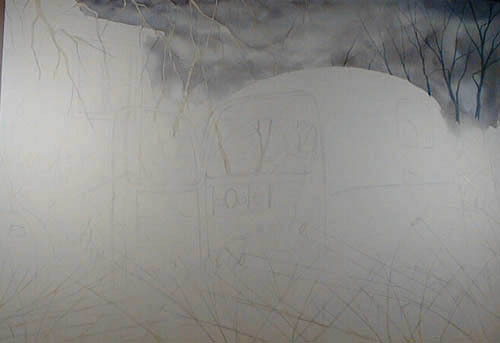 It is time to get some of the grass/brush parts of the painting layed in. I using a wash of aureolin. I do this wash wet on dry–but as I go along, I’m adding good amounts of water so I get almost the same effect of wet on wet. Right now, all I’m interested in is filling area with the right color. There will be more work to be done in these areas, but a bit later in the painting. I read somewhere that the part of our brain that interprets depth also processes value. One of the strongest elements we can use to build depth in our paintings is value. Light against dark or dark against light, both combinations help us to build depth in our composition. Several things are happening here. 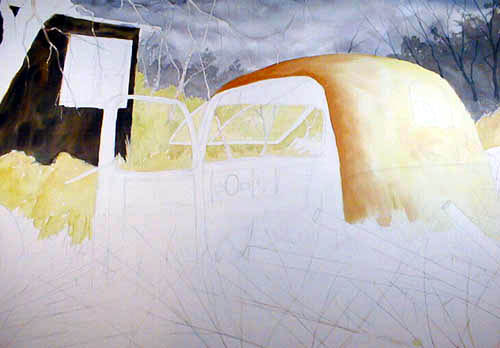 I’ve started building depth with dark washes on the interior of the truck. These washes are done with a mixture of thalo blue and red rose. Mixed with pure pigment, it makes a nice juicy dark. I’ve also layed in another wash on the truck body, continuing to build form. I’ve introduced some burnt sienna at this pointing. This wash was done wet on dry, but adding liberal amounts of water throughtout the process. The reason I do the wash wet on dry is that I want some variation in the wash to build texture on the truck body. 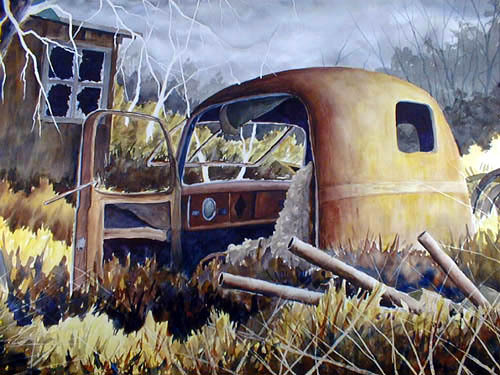 I’ve also painted the car body to the left of the truck with a wash of ultramarine blue and burnt sienna–blue being the predominant pigment. 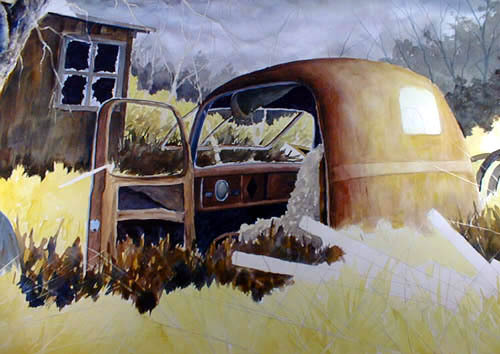 I’ve also started defining the window on the house, completed initial washes on the truck door and layed in a light wash of aureolin below the truck door. As artists we are fortunate that we can go where our heart and intuition take us. This painting is a good example–the orginal subject had good form, but let a lot to be desired in the way of color. 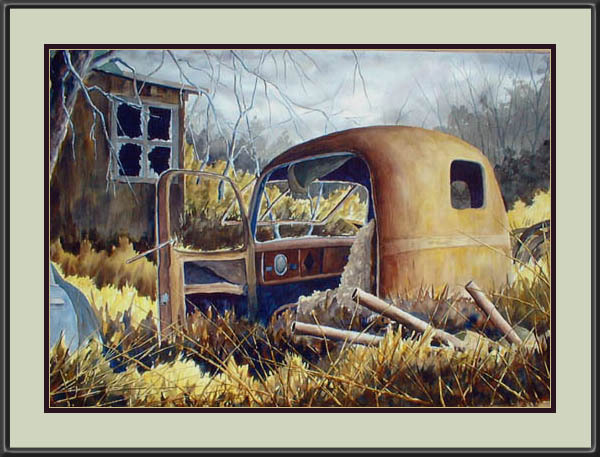 I don’t have the slightest idea whether this truck could have been yellow, but it was my choice and I went with what I felt would work for this painting. 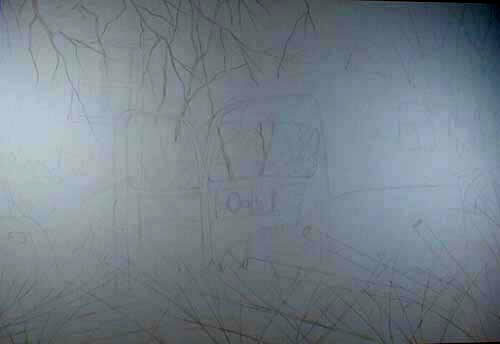 I’ve continued to build the dark area on the inside of the truck. These real dark areas are thick pigment–a combination of thalo blue and red rose. You can see that I’ve started defining the upper part of the door and painted in some fabric that is dropping down from the ceiling of the truck. 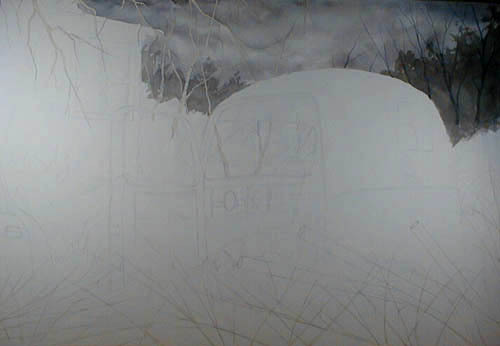 While I’m working through the detail of the truck, I’m thinking about where I want to go with the light and dark shapes in the foreground. I’ve also worked on the door, adding dark areas where the interior of the door has fallen out. Since I spend a great deal of time with these old relics, I’ve learned a lot about them. If I can’t see what I need in my photo, I know enough to invent what I need to make the painting work. I never miss an opportunity to observe things around me because I know I will be able to use that information in a painting one day. I mentioned the tree texture thing, and I think the reason I like watercolor is that it lets me create textures that can’t be found with any other medium. Whatever subject we look at–the light is just doing all sorts of things on the surface. Watercolor lets us capture that happening. It is time to get serious about the foreground. 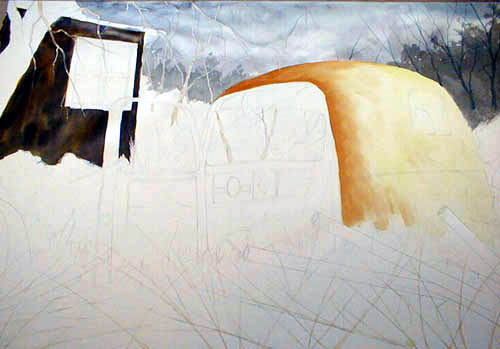 I need to set the form of the truck off and need a dark shape in the foreground. The dark wash that is a mixture of burnt sienna and ultramarine blue with a light wash of quinacridone gold applied after the main wash was dry. The wash is done wet on dry with burnt sienna. Once the burnt sienna is in, I go back and add the ultramarine blue at the bottom of the sienna wash–letting it mix on the paper. It is important that you let it mix on the paper and don’t mess with it or it will turn to mud. I leave small areas of white paper and then apply washes of water to let the burnt sienna and ultramarine blue seep into those areas. In the photo I’m working from, there is no seat in the truck cab–but I’ve elected to add a seat. To define the seat I’ve done a light wash of a warm gray–making sure it is not a consistent wash–pigment–a splash of water, more pigment and more splashes of water. I want an uneven texture to give the effect of the stuffing coming out of the seat. I’ve painted the tree trunk on the left side of the painting–to create the texture on the trunk, I get some pigment and introduce vertical strokes along the trunk. Then I get a couple of pieces of watercolor paper that I’ve cut in two inch wide strips–about 8 inches long. I lay them to either side of the trunk and then pull out my spray bottle of water. I squirt some water on the trunk and let the pigment blend–adding a few strokes with my brush until the texture feels right for whatever kind of tree I’m painting. It works for me. 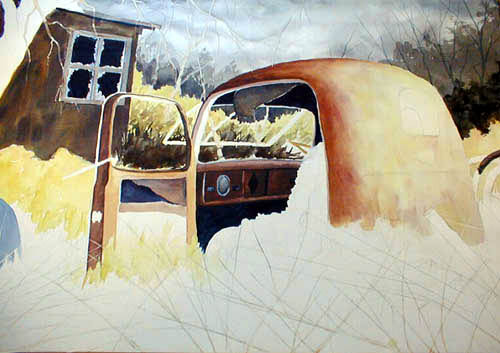 I’ve continued to work on the truck body–building better form with washes of burnt sienna in the shadow area. I’ve also added some aureolin washes on the light side of the body. 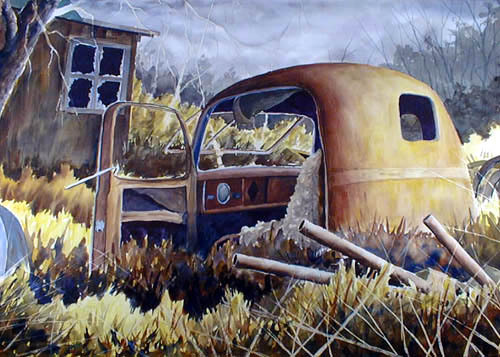 For the darker areas, the washes are done wet on dry–in the light areas, they are done wet on wet–but I push them to almost when the paper is getting dry because I want a little texture on the body of the truck. The pigment will diffuse, but it won’t move too well. You may notice that I’ve also brought out an area across the back of the truck–it is a raised area. I used a bristle brush to lightly scrub out the stripe. The foreground it starting to come together. 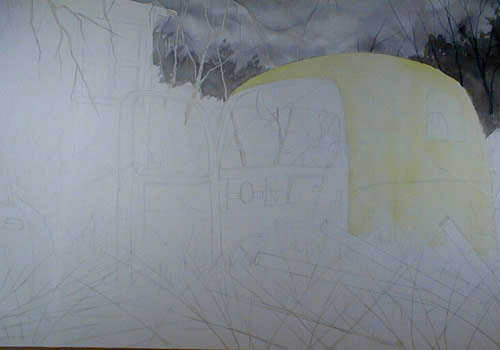 Here, I’ve added a light wash of aureolin to start establishing what I want to do in the foreground. I like to put in a big general wash like this to let me get a feel for where I want to go with a particular area. I’m sure some artists just see where they want to go and just do it straight out. That doesn’t seem to work for me. I always need a little warm-up. You can see that bright area on the right side of the painting–it is really a light yellow wash of aureolin but for some reason it is not coming out in the digital photo. I have been taking these photos in my studio–sometimes during the night and sometimes during the day. Because of the low light conditions, the contrast is good, but the color isn’t quite there. You can see I’ve carried the shadow from the right on over across the truck body to better set off the truck body. Again I’ve used some strokes of burnt sienna and then introduced some ultramarine blue at the lower part of the wash and then let it blend together–sometimes bringing stokes of the ultramarine up on the shadowed side of weeds. I always hate this portion of the painting because these dark areas in the foreground are really necessary to make the overall composition work–but they are harder than heck to make happen correctly. I seldom get them as right as I would like–but manage to muddle through. They need to have intensity of color without mud, have just the right amount of dark, medium and light values. I keep thinking that one day I will understand how to do this well, but so far it has eluded me. These washes are done wet on dry–nice and dark, leaving open areas where I can overlay to create the medium and light values. Usually I will paint the whole thing at one time, but since this is a demonstration, I elected to put in the dark values and leave it for a digital image. Due to the nature of my digital camera photos, the dark areas are darker in the images than in the real painting. I haven’t taken the time to adjust the images and don’t thing I will. That is a complicated process, in and of itself, it takes a lot of time to get it right. I want to hold the eye to the center of the painting and to do that I need a good wash of dark on the bottom of the painting. I menitoned above that I hate this part of the painting because it is so critical. This is one wet on dry–with some solid pigment–the combination of burnt sienna and ultramarine blue I have mentioned above. I try to get some solid darks in–throw in a few more medium darks–and leave a few highlights. On a scale of 1-10–with 10 being the best, I would describe this effort as about a 6. It didn’t work as well as I would have hoped. Since I stopped the painting for the previous image, this wash was a matter of adding a few more darks, all the mediums, and letting the lights do their thing. The mediums were done wet on dry–just quick slaps of pigment mixed with burnt sienna and ultramarine blue. For those of you artists that are into lots of color, I’m sure I’m driving you crazy. What can I say? I’ve established the theme I want to use for this painting and I’m sticking to it–it may not be all that dynamic, but it will hold the whole compositon together. You can see the stems of the brush in the foreground–the stems are still masked. These stems will be the last part of the painting. I know there are things I’m leaving out here–as I paint, I see things that need to be attended to–and just grab some pigment with my brush and do what I feel I need to do. You will note that I’ve layed in a dark area for the back window of the truck. I’ve been dying to get to that–dark against light—the ultimate for a watercolor artist. By this time, you may have been wondering what those shapes were in the foreground coming from right to left. I’ve painted them in–and as you can see, they are pipes of some sort. These weren’t in the original photo, but I found them in another photo from another junk yard. My compositions are usually built from parts of many photos. At this point in my artist life, I have about 10 albums of photos that I draw on for paintings. The pipes were done wet on wet. I wet the whole length of the pipe and then introduced pigment on the dark side and let it flow and gradiate to the light side. The wash was mostly burnt sienna with just a hint of ultramarine blue at the bottom of the darker area. I again let it mix on the paper. I’ve removed the mask from the tree branches coming down into the painting from the top. 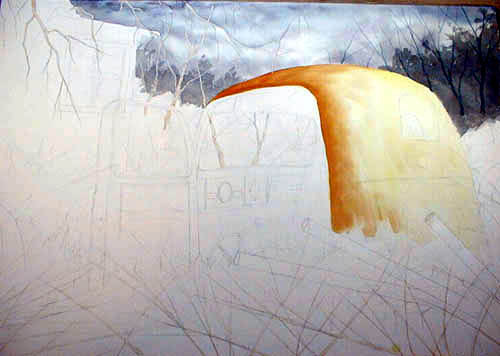 At this point, the main passages of the painting are completed. I refer to this part of the painting as my mob-up campaign. I just take care of the little details. In this case, all I’m doing is painting in the tree limbs–one light wash of cobalt blue–let dry and then build a little form with the addition of burnt sienna on the side of the limbs away from the sun. Once the stems are completed, I go back one more time and hit different areas with a medium wash of burnt sienna–I don’t want the bright stems to be too strong–a few highlights and the effect of shadows falling across the stems. I’ve finished the limbs and have removed the mask from the brush in the foreground. We are now into the final stages of the painting. To paint the stems of the brush, I first wash each individual stem with a mixture of aureolin and quinacridone red–just enough red to bring the aureolin toward the orange–not too much. Once that is complete, I do the same that I did with the tree limbs–using a wash of burnt sienna, quinacridone gold, and a bit of ultramarine blue, I build form on the stems. I’m not too particular with this process–I want variation on the stems and some of them get covered completely with pigment. This is the final product. It is hard to estimate my painting time as I’m sometimes painting, sometimes looking, sometimes playing on the computer. A rough estimate would be about 10 hours. You will notice better color in this image and that is because I took the painting out into the daylight to get the final image. I learned something here–when the images are taken inside my studio in lower light conditions, the contrast is better and the color is worse. When in the daylight, the color is better and the contrast is worse. However, the contrast is much easier to adjust. 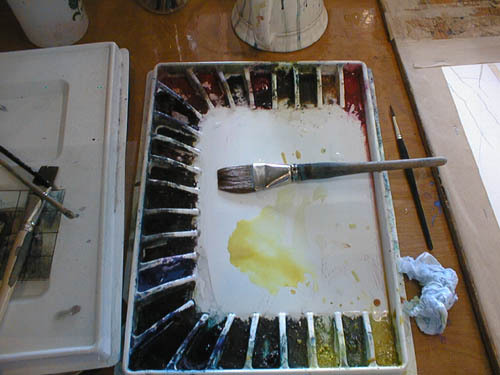 My palette consisted of the following colors: aurelolin, quinacridone gold, red rose, ultramarine blue, burnt sienna, cobalt blue, and quinacridone red.